Azalea indica ‘George L. Taber’ is in the Southern Indian or Indica group of Azaleas. These Azaleas are spring blooming and the foliage is evergreen. 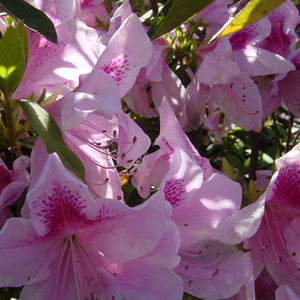 These Azaleas have an upright growth habit and are the best choice for a high light area. The George Lindley Taber Azalea blooms in mass midseason with large single petals, the color is an orchid to pink and the showy blooms are also variegated. A moderate grower from 6-8 feet tall and 4-6 feet wide.